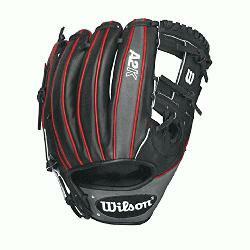 Wilson A2K Baseball Glove 1787 model 11.75 inch. 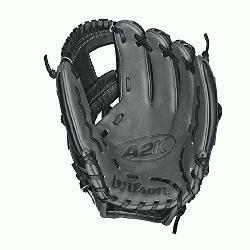 11.75 Inch Pattern Wilson Baseball Glove. 3X More Craftsman Shaping - Reduces Break-In, Ensures Ideal Pocket Structure. Color Black With Dark Grey And Red. Double Palm Construction - Prevents Premature Wearing of the Leather in the Palm. I-Web with Double X Laces. Ideal for Infield Play. Maximum Pocket Stability. Pro Stock Select Leather - Cut From Top 5% of All Wilson Leather Hides. Rolled Dual Welting - Allows Glove to Retain Shape Better Over Time.